November is a month for family and friends and hosting Thanksgiving is something I look forward to every year. 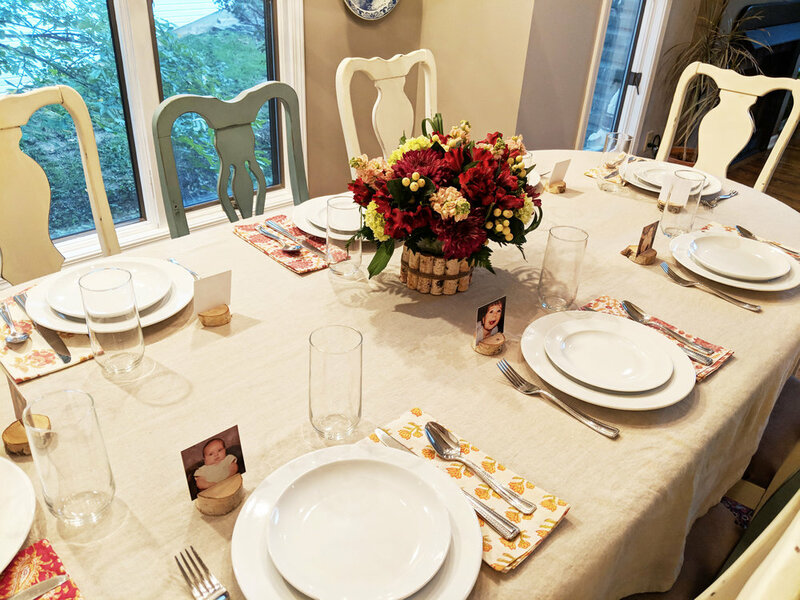 Making my Thanksgiving table casual and welcoming is important so all my guests feel at home during their visit. 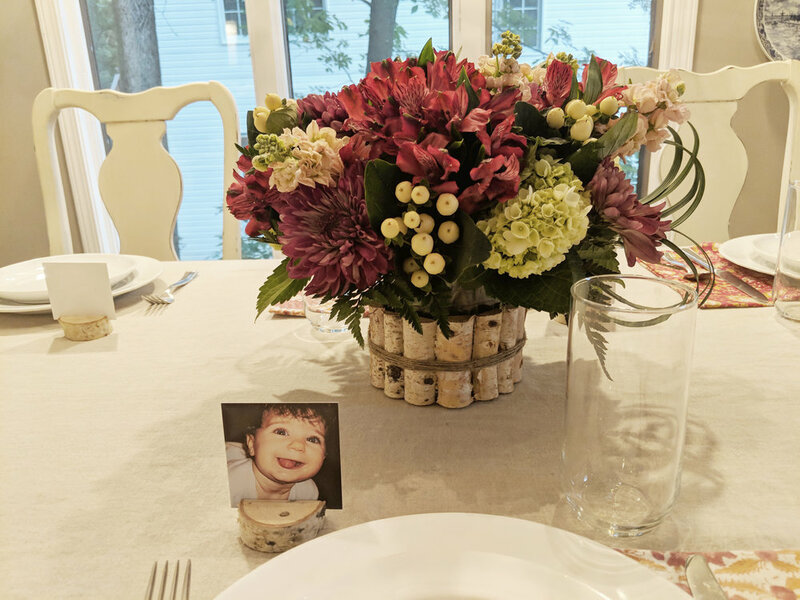 Instead of a crowded overdone display I prefer to let my many dishes of homemade food be the centerpiece so choosing only a few pieces to decorate my table keeps it uncluttered for plenty of good eats. This year I wanted to create place cards for each of my guests. 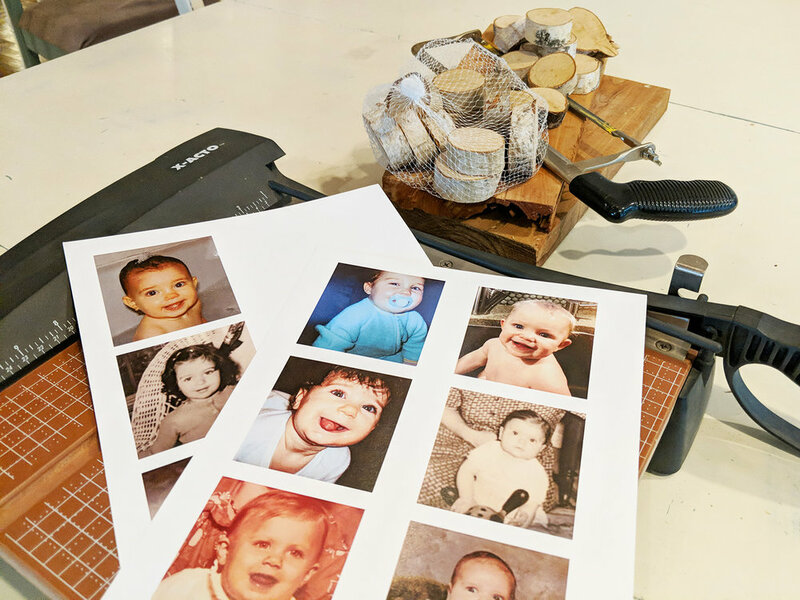 With my background as an event designer I have seen every place card you could imagine, and I wanted to do something fun and different, so instead of writing everyone’s names on the cards I decided to print out cute baby pictures of each of my guests to use as a marker for them to find their seat. Putting them in small frames would work, but frames can be pricey and would take up too much room on the table. Instead I wanted something simpler that would act as a holder or a stand. I wasn’t quite sure what I was looking for, but shopping at the craft store I found a display of birch décor. The white bark of the branches would be a perfect accent with my all white china and my natural linen tablecloth. 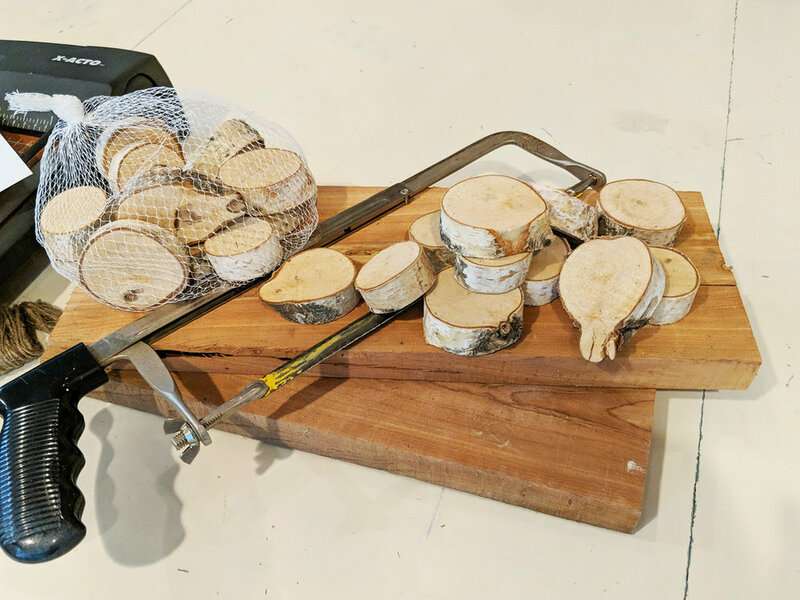 In the display were small bags of birch branch slices. They were all cut and sanded and super affordable, only seven dollars for twelve rounds. These would work perfect. After getting them home the only doctoring they needed was a cut down the middle to create a holding space for the photograph. A small hacksaw made quick work of it. I made sure to cut deep enough that the photograph would be held up well and wouldn’t fall out. Now finding all those baby photographs took a little doing. After hunting them all down it was important to make them all a uniform size, and not too large. Three by three inches ended up being the right dimensions for this project and worked well with the scale of the birch rounds. After resizing them all I printed them on a heavy matte cover stock. The matte finish worked well with all the natural elements I was using and the cover stock was thick enough to make the picture rigid in the holder. The only other element I decided to add was a fresh floral arrangement in the center. I acquired a few more birch branches and tied them around the glass vase to continue the theme. When hosting Thanksgiving keep it simple and casual and have fun with it. Just be yourself and make your guests feel welcome, that’s what it’s all about.